"And then, without warning, I watched my youngest child take a step and then slide right off the mountain ..."
my soul would soon have dwelt in the land of silence. thy steadfast love, O Lord, held me up. One day when we were living in Hawaii, my family went for a hike along the Tantalus ridge, which would bring us right along the top of Tantalus volcano to the very back of the valley we lived in. We would then take the trail straight down past Manoa Falls and the abandoned Paradise Park, and then out again into the Manoa Valley neighborhood. Our kids were with us. It was a beautiful day: blue sky, perfect temperatures. This was going to be the longest hike we had taken as a family. My “smalls” were very young to be doing such a long hike. Bethany was five years old; Mark was six. My two “bigs” were eight and nine. And, of course, we had Biscuit the dog with us. We were excited — this was going to be a grand adventure. Except we didn’t take one thing into account. One thing a person notices pretty quickly about Hawaii, especially in the area we lived in, is that it’s not uncommon for the clouds to build up throughout the day, crowning the volcano peaks and then shedding themselves of their water in the mid to late afternoon. We called it “liquid sunshine,” because many times it would be pouring, yet seem perfectly sunny, too. The weather was fascinating. We should have started out earlier in the day, but there was much too do on this “day off,” and we kept adding little things to the schedule, so by the time we started out it was mid-afternoon. About an hour into our hike, the liquid sunshine began. It rained. Then it poured. The rain itself wasn’t a problem. We were all used to rain — one gets very used to it, living in the Manoa valley. We trudged along, because really, there was no other choice. There was nowhere to stop on this trail that hugged the side of the mountain, and was only maybe two feet wide, if that. And the rain kept raining. And the trail became muddier and muddier and muddier. After about an hour of this, I knew we were in trouble. It was raining so hard we could barely see each other, let alone know where we were. Worse, the trail itself was becoming treacherous. And then, without warning, I watched my youngest child take a step and then slide right off the mountain. In those split seconds, I imagined her falling all the way down to the valley floor. I dropped to my hands and knees and looked over the edge, fearing I wouldn’t see her — but there she was. Terrified, muddy, crying, but she was there. She had landed in a tree, just about ten inches out of the reach of my hand. My husband was just ahead of us on the trail, but the rain created a virtual wall that kept him from seeing what had happened. Desperate, I tried to grasp something — anything — to plant my feet on, something solid, in hopes that I could reach down and grab her and pull her back up. But I couldn’t find traction. The mud was now more water than anything else, and I couldn’t get a grip on it with my feet. Over and over and over again, they slipped just like her little foot did. If I wasn’t careful I would pitch over the side as well, and knock her out of her temporary safe perch on the tree branch below us. With each slip of my foot, I panicked a bit more. Through the pounding rain, though, my girl’s father finally heard me screaming, and he stopped and backtracked to where we were. He immediately leapt down to — well — something. I can’t remember if he actually found ground to stand on near her, or if he landed in the tree next to hers. Either way, somehow he found a way to plant himself and convince her to let go of the tree so he could pass her up to my waiting arms. She was ok. We were ok. After a few minutes rest so her father could climb back onto the trail — and we could gather our wits and calm down a bit — we proceeded on the trail. In the rain. And the mud. But far more cautiously than we had before. It is terrifying not to be able to find something solid to stand on. 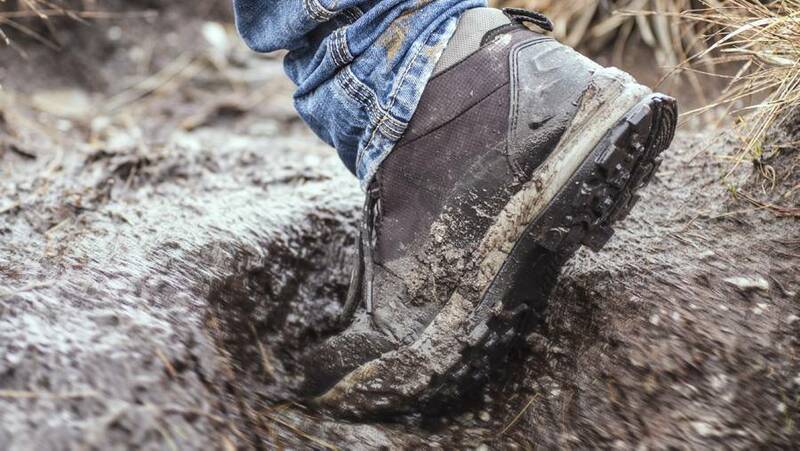 It’s frightening when we feel our feet slipping, and we don’t know how to stop them, whether on a muddy trail on the mountain, or on the perilous trail of life here on earth. The words in Psalm 94 (above) are not quiet, hushed, meditative words. At least, I don’t think so. No, I believe that the writer of this Psalm, as he penned these words, was in a panic situation. A very real, very horrifying panic situation. He knew the very real sensation of his foot slipping; and he knew that his only hope was God. It is God who would rise up against the wicked that surrounded him. It is God who would stand up in defense and protection of his mind, soul and body. It is God, and God only, who possesses the very steadfast, solid love author the author needed to fight for purchase on this muddy thing we call life here on earth. It is God — when the things of this world threaten to drown out reason and our own steadfast faith — it is God and only God who will not forsake or abandon us (94:14), and it is He who beckons us to the very reality of verse 17: He is our help. He is the consolation that cheers our soul. He is the truly bright essence of liquid sunshine — the only hope that can break through the choking darkness, much like the sun often breaks through the rain in Manoa Valley, producing the most spectacular rainbows on the face of this planet. It is only our God who can do this. I don’t know about your souls and minds, dear reader, but I know mine, and I recognize the slipping of my mind, and the panic in my soul. It slips so often because of so many different things: lack of spiritual disciplines, choking fear, consuming worry, default cynicism and doubt, loneliness, deep griefs and so many other things can cause my foot to slip. But I also know this: When that intense panic comes, it is to God, my Father, I must run. He and He alone can take hold of my wavering faith and my slipping soul and place them on Himself, the only true, firm and steady rock. His steadfast love holds me up. His consolations fans embers of joy into flames. He alone is my stronghold. Originally published at All is Well. Used by permission.